An exciting, holistic, rigorous programme of study recognised in Australia and around the world. The final two years of high school are a launching pad for success at university and beyond. The IB Diploma is widely considered an excellent pathway for future success. It is designed as an integrated whole, where subjects across a range of disciplines work together to ensure students develop their creativity, critical thinking skills and global awareness as well as being active members of their communities. 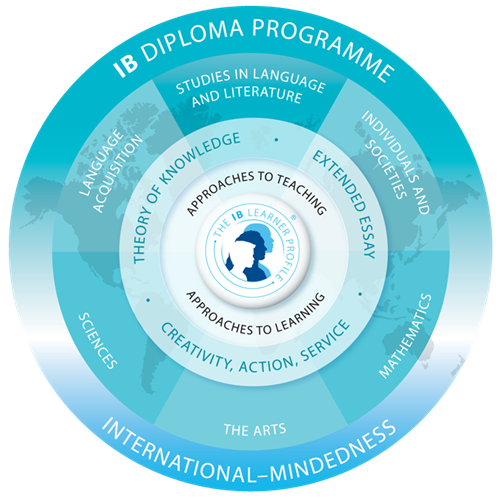 The IB Diploma encourages breadth of study by requiring students to take 6 subjects from a range of subject areas: English Language and Literature, a second language, Humanities, Science, Mathematics and the Arts (although students may take an additional subject from any of the other subject areas in place of the Arts). All students also study a common core. in a variety of co-curricular activities that are designed to give back to their communities and develop international awareness by ‘thinking globally and acting locally’. Extended Essay (EE) – Students develop a research question on an area of interest and produce a 4000 word academic report. This flagship element of the programme sets Diploma students apart at university, as they develop the skills of extended academic inquiry and writing. Theory of Knowledge (ToK) – students are taught to question how we know what we know and to think critically about the reliability of different kinds of knowledge.